Cranberries have long been known to women for the health of the urinary system. However, cranberry juice is very sharp to the taste and consequently many commercial cranberry drinks are often laden with sugar and high in calories. 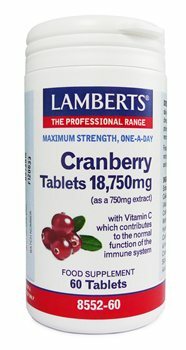 A more convenient way to take cranberries is in the form of tablets but often these can be a compromise on potency. As the leading experts in nutrition and herbs, we have developed taste-free coated tablets that contain an unrivalled 750mg of concentrated cranberry extract, equivalent to a full 18,750mg of whole fresh cranberries per tablet. These maximum strength tablets provide a significant amount of cranberries without all the sugar and calories. Vitamin C is also included, which contributes to the normal function of the immune system. Cranberry Extract, Calcium Carbonate, Cellulose, Vitamin C (Ascorbic Acid), Tablet Coating (Hydroxypropyl Methylcellulose, Hydroxypropyl Cellulose, Colours: Titanium Dioxide & Iron Oxides, Glycerin), Crosslinked Cellulose Gum, Silicon Dioxide, Stearic Acid, Magnesium Stearate. Take 1 tablet daily with a meal, or as directed by a practitioner or pharmacist. Do not exceed the recommended daily dose. This product is free from wheat, gluten, yeast, dairy, soya, nuts and shellfish. This product is suitable for all adults. This product is suitable for vegetarians.